After the rush and adrenaline of his job as an LA paparazzo, the last place Cody Belshaw wants to be is back in the small town where he grew up. 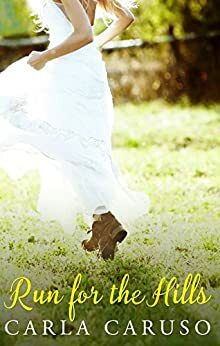 But thanks to a clause in his father's will that amounts to blackmail, Cody and his two brothers are stuck running a wedding business for at least a month. If there's one thing that he's learned in LA, however, it's to keep business and pleasure very, very separate. Which makes his new admin employee the definition of temptation. Bridie is desperate to stay anonymous. Cody seeks out secrets for a living. As they delve into the world of brides, boutonnières and dogs–as–best–men, both Cody and Bridie will have to decide if this is a fling...or forever. Carla Caruso was born in Adelaide, Australia, and only 'escaped' for three years to work as a magazine journalist and stylist in Sydney. Previously, she was a gossip columnist and fashion editor at Adelaide's daily newspaper, The Advertiser. She has since freelanced for titles including Woman's Day, Cleo and Shop Til You Drop. These days, in between writing romantic comedy novels (sometimes with a touch of cosy mystery), she plays mum to twin sons Alessio and Sebastian. Her books include the 'Astonvale' rom-com mystery series (kicking off with A Pretty Mess), Catch of the Day, Second Chance, and Cityglitter. She's also an editor of the Romance Writers of Australia journal, Hearts Talk, and has a foodie blog, www.theunitalianwife.com. Plus, she's obsessed with running, horoscopes, fashion, upcycling vintage finds, trashy TV, and cats. Run For The Hills was fantastic love story. Carla Caruso did a phenomenal job writing this book, I could not put it down, I read it in one day. I loved this book and it opened my eyes up to true love in a story. The love that Cody Belshaw and Bridie Porter find for each other was so exciting to see through the authors eyes. Please read this book to fall in love all over again. Bridie Porter was running from her wedding after she got a compromising picture of her fiancee on her wedding day. She flees to a small town in the Adelaide Hills; there she gets a job at "Goldlake Manor". It is a Wedding Venue for which she becomes their marketing director and receptionist. This is where she meets the Belshaw Brothers; Cody is a triplet, his brothers are Vance and Jaxon. The business was their Dad's, until he passed. They have to make it work for a month or it is going to be turned into a dog kennel. Cody and Bridie spend most of their time together and secretly start seeing each other. This is the first book I have read from Carla Caruso and I look forward to reading more books by her. This is a great standalone story that I really wish was part of a series. Birdie got a pic of her fiance that wasn’t very nice on the wedding day Birdie then goes on the run. Her ex fiance was a multimillionaire hotelier and the media was going crazy with the story of Birdie the runaway bride and they were all looking to get a pic of Birdie the runaway bride.” . When Birdie ran she left her job, her family, her friends behind. Birdie ran to a small town and gets a job at Goldlake Manor as a marketing director/receptionist for a wedding venue. There are a set of triplets who are running the venue and have to keep it going for a month per their dad’s will or it would become a dog kennel. The triplets were Cody, Vance, and Jaxon. Cody is actually a LA Paparazzi and couldn’t wait to get back. Of course Birdie is attracted to Cody who could blow her cover and they start seeing each other but did so in secret. This was a good story and I really enjoyed it. This had a good plot and had great writing. It was a short story but did not lack anything. This made me chuckle at times. I did find the end predictable but still enjoyed it. I loved the characters and the ins and outs and I recommend. I really enjoyed this book even though I'll admit the slang occasionally went over my head. Bridie ran away from her wedding for a fairly understandable reason. The ensuing chaos was a bit amusing, esp watching her and the triplets as Cody tries to hide his former relationship with a pop star that's in the gossip rags and she tries to keep her identity a secret. Watching the guys work the wedding business their father loved, watching Cody and Bridie fall in love.....it was so warming. I knew her identity would come out but the resultant events had me on the edge of my kindle. A sweet romance with just enough steam, gives you the feels and holds you tight from start to finish. I'll definitely be reading more by Carla in the future. Birdie finds out about her groom on her wedding day and makes a run for it. Cody is returning home comes across this runaway bride who does not want her secrets to come to light. What a bumpy road to their romance.